The Carry-out G2 is the next generation of portable satellite TV antennas, offering live TV viewing for the on-the-go lifestyle! At 40 percent smaller than Winegard's popular Carry-out, this compact, fully automatic satellite antenna is the smallest of its kind on the market and perfect for RVing, camping, tailgating and more! Carry-out G2 is compatible with DISH (SD & HD), DIRECTV (SD) and Bell TV (SD & HD), and works with a wide variety of receivers. Equipped with two coax ports, the G2 supports two receivers so you can watch different programming from the same satellite on 2 TVs at once. Plugs into a standard 12V outlet in your vehicle (12V power converter to 110V sold separately). Features an easy grip handle and security eyelet attached to the base. 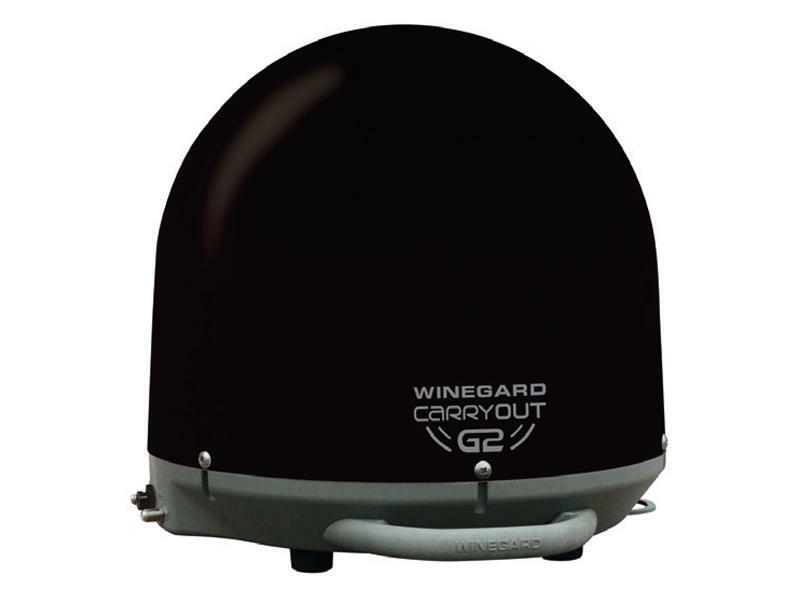 The Carryout G2 also offers the unique ability to convert to a roof mount antenna for stationary use. Roof Mount Kit (RK-2000) sold separately. Includes 50 foot power and 50 foot coax cables. 13.5 inch dome height, 14.3 inch diameter. Designed and manufactured in the USA. Black dome.